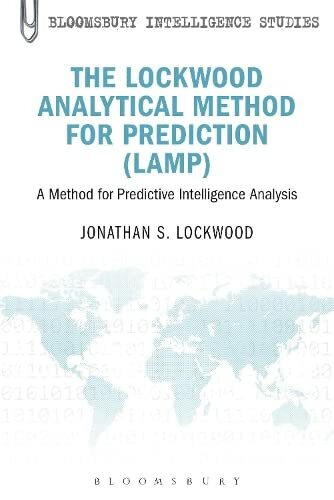 [PDF] The Lockwood Analytical Method for Prediction (LAMP): A Method for Predictive Intelligence Analysis | Free eBooks Download - EBOOKEE! Description: The Lockwood Analytical Method for Prediction (LAMP) is a systematic technique for predicting short-term, unique behaviors. Using primarily qualitative empirical data, LAMP allows the analyst to predict the most likely outcomes for specific research questions across a wide range of intelligence problems, such as cyber threats in the U.S., the possibility of an Al Qaeda attack, the likelihood of Iran providing nuclear capability to terrorist groups, or the future actions of the Mexican drug cartel. LAMP offers an innovative and powerful method for organizing all available information based on the perceptions of the national actors, using it to make relevant predictions as to which alternate future is most likely to occur at a given moment in time. Its transparent structure enables anyone to see how an analyst gets from point A to point B to produce an intelligence estimate. LAMP differs from other analytical techniques in that it is based on determining the relative probability of a range of alternate futures, rather than attempting to determine the quantitative probability of their occurrence. After explaining its theoretical framework, the text leads the reader through the process of predictive analysis before providing practical case studies showing how LAMP is applied against real world problems, such as the possible responses of Israel, the U.S., and Lebanon to the behavior of Hezbollah or the competing visions of the future of Afghanistan. Evaluation of the method is provided with the case studies to show the effectiveness of the LAMP predictions over time. The book is complemented by a website with downloadable software for use by students of intelligence in conducting their own predictive analysis. It will be an essential tool for the analyst and the student, not only for national security issues but also for competitive intelligence. No comments for "[PDF] The Lockwood Analytical Method for Prediction (LAMP): A Method for Predictive Intelligence Analysis".